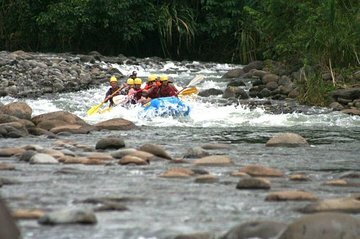 Navigate the rapids of the Reventazón River on this full-day whitewater rafting trip from Limon. Get a mix of churning class-II and -III waves plus calmer sections on the scenic 10-mile (16-km) run known as El Carmen. Take a break from paddling to enjoy a picnic lunch on a beautiful beach, and look for Costa Rican wildlife in the lush Caribbean jungle that flanks the river.